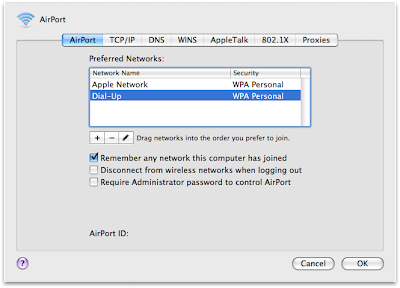 A New Mac Tip Every Day: Removing wireless networks from your preferred list! Removing wireless networks from your preferred list! Like I posted on my Facebook page, I was stuck on dial-up for a week and the way I handled it is I retrieved my old airport extreme and set up dial-up on a second network. Since then, every time I restart my Mac, it automatically logs on to the Dial-Up network which of course has no internet access right now. The best thing to do in that case is to remove that network from your preferred list of networks. That can be done in the airport section of System Preferences. From there, you click on Advanced. A list of preferred networks will then be displayed in the Airport tab. This was amazingly useful. i too switched internets, and every time i turn my computer on it went to the old internet. i know i sound like george bush, but it was the quickest way to say it. Is this Leopard only? I can't seem to find it. You also find this in Tiger. When you try to configure Airport, you see a drop down (combo) that says "By default join: Automatic". Change it to "Preferred Networks". Bingo !! There is the list for you to manage !! The MacUpdate bundle is back! Switching Spaces with the mouse!